GolfNow is a one-stop shop for golfers’ tee time booking needs. Started as a regional e-commerce website, the company was acquired by Golf Channel in 2007 and has since evolved into the leading online provider of tee times and golf technology worldwide. GolfNow helps more than 3 million registered users book their tee times online at 9,000 golf courses in 16 countries, including the United States, Canada, and the United Kingdom. It also provides technology solutions to golf courses around the globe. In 2013, GolfNow improved its customer experience by modernizing its website. As part of this effort, the company added Amazon Pay to its payment options to create a “fast lane” checkout experience. 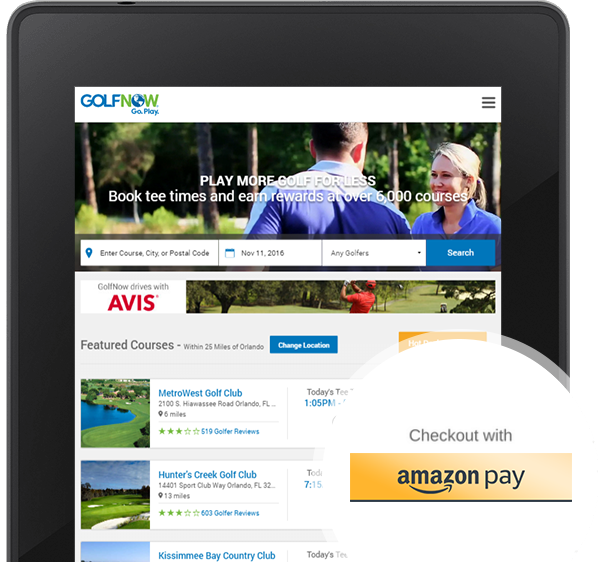 GolfNow quickly integrated Amazon Pay into its desktop and mobile platforms, and the result has been significantly quicker checkout times and a payment option golfers trust. GolfNow offers Amazon Pay so it can provide faster booking for customers wanting to bypass the extra steps required to create an account. “We offer benefits to customers who sign up for an account, but also wanted to include an option for those who simply want to book quickly and get on with their day,” says Mike Lowe, GolfNow’s Vice President of Product Development & User Experience. “With Amazon Pay, customers choose their tee time, log in with their Amazon credentials, and click ‘book now.’ That’s it. It’s our fastest payment option from start to finish." Amazon Pay has had a halo effect with the customer. We’re working with a reputable company that takes the storage and transmission of financial information very seriously. Offering this option has brought trust and credibility to our entire process, and it makes customers feel good about us as a company.